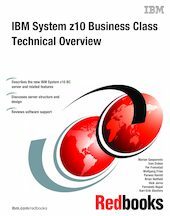 This IBM® Redbooks® publication introduces the IBM System z10™ Business Class (z10 BC) server, which is based on z/Architecture® and inherits many of the improvements made with the previously introduced System z10 Enterprise Class (z10 EC) server. With a focus on midrange enterprise computing, the z10 BC server delivers an entry point with very granular scalability and an unprecedented range of capacity settings to grow with the workload. It delivers unparalleled qualities of service to help manage growth and reduce cost and risk. The z10 BC server further extends System z® leadership by enriching its flexibility with enhancements to the just-in-time capacity deployment functions. This book provides an overview of the z10 BC and its functions, features, and associated software support. Greater detail is offered in areas relevant to technical planning. This book is intended for systems engineers, hardware planners, and anyone wanting to understand the System z10 Business Class functions and plan for their usage. It is not intended as an introduction to mainframes. Readers are expected to be generally familiar with existing System z technology and terminology.